Our “baby” teeth begin appearing around six months of age — by age 10 or 13, they’ve largely been replaced by our permanent teeth. Though their lifespan is relatively short, baby teeth play an important role in our dental development. In fact, saving a damaged baby tooth is an extremely important treatment goal even though they will be eventually lost. Baby teeth perform a number of functions as our mouth and facial structure develops during our formative years (infancy to early adulthood). Besides providing a means to chew food, baby teeth aid speech by providing contact points for the tongue while speaking. They help us relate to others socially through smiling and other facial gestures. And, in relation to our long-term development, they serve as both guides and “placeholders” for our permanent teeth until they’re ready to erupt. 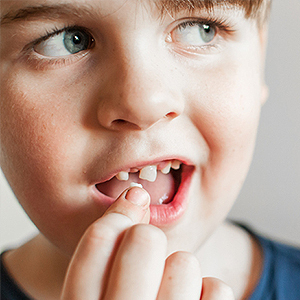 Thus, a permanent tooth’s development could be stymied if its counterpart baby tooth is lost prematurely. It could come in misaligned or not erupt fully if adjacent teeth have drifted into the open space. The resulting malocclusion (bad bite) could require long-term orthodontic treatment with higher costs than treatments to save the baby tooth and avoid the misalignment. There are various treatments to prevent and save at-risk baby teeth. Even a badly decayed tooth might be saved with a pulpotomy, a similar treatment to a root canal but less invasive. This is often followed with a stainless steel crown to cover the remaining tooth and restore some of its form and function. If it’s not feasible to save a baby tooth, we may recommend installing a space maintainer that prevents other teeth from drifting into the resulting space until the permanent tooth is ready to erupt. This orthodontic appliance usually consists of a metal band cemented to an adjacent tooth with an attached stiff wire loop that extends across the gap and rests against the tooth on the other side. Although effective, space maintainers can break or become dislodged, require extra monitoring and are often cosmetically unappealing. In any event, the primary goal should be to save a baby tooth, if possible. Doing so will prevent more serious long-term problems for permanent teeth. If you would like more information on the importance of baby teeth, please contact us or schedule an appointment for a consultation. X-ray diagnostics have revolutionized our ability to detect early or hidden cavities, paving the way for better dental care. But x-ray exposure also increases health risks and requires careful usage, especially with children. A form of invisible radiation, x-rays penetrate and pass through organic tissue at varying rates depending on the density of the tissue. Denser tissues such as teeth or bone allow less x-rays to pass through, resulting in a lighter image on exposed film; less dense tissues allow more, resulting in a darker image. This differentiation enables us to identify cavities between the teeth — which appear as dark areas on the lighter tooth image — more readily than sight observation or clinical examination at times. But excessive exposure of living tissue to x-ray radiation can increase the risk of certain kinds of cancer. Children in particular are more sensitive than adults to radiation exposure because of their size and stage of development. Children also have more of their lifespan in which radiation exposure can manifest as cancer. Because of these risks, we follow an operational principle known as ALARA, an acronym for “As Low As Reasonably Achievable.” In other words, we limit both the amount and frequency of x-ray exposure to just what we need to obtain the information necessary for effective dental care. It’s common, for example, for us to use bitewing radiographs, so named for the tab that attaches the exposable film to a stem the patient bites down on while being x-rayed. Because we only take between two and four per session, we greatly limit the patient’s exposure to x-rays. Recent advances in high-speed film and digital equipment have also significantly reduced x-ray exposure levels. The average child today is exposed to just 2-4 microsieverts during an x-ray session — much less than the 10 microsieverts of background radiation we all are exposed to in the natural environment every day. Regardless of the relative safety of modern radiography, we do understand your concerns for your child’s health. We’re more than happy to discuss these risks and how they can be minimized while achieving maximum benefits for optimum dental health. Our aim is to provide your child with the highest care possible at the lowest risk to their health.